Join the discussion on our forums! 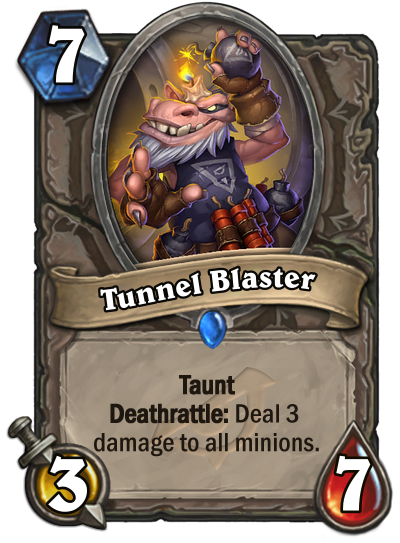 Come discuss Tunnel Blaster over in our dedicated Tunnel Blaster discussion topic. Y'all sleeping on this guy, mark my words. Play dead and terrorscale will rotate. But still, nine lives is very very good! Especially against aggro! Not a Chillmaw, but I'll take it. Agreed. Chillmaw was somewhat playable b/c of grim patron. I’m looking forward to see if this card will find its place in the upcoming meta. This would be the lesser version though. It may have 1 more health, but 3 less attack and the lack of the dragon tag can hurt a lot more than expected. Its effect doesn't have the versatility of being switched on or off too, not being able to invoke the same guessing games of old.